We hope you're enjoying a beautiful holiday! We had a lot of fun decorating our house for Halloween this year. Our enthusiasm apparently rubbed off on some of our neighbours and several other houses on our block joined in on the fun and handed out candy this year. We only had about a dozen kids come by, but that's up from the 3-5 we have gotten in years past. Axel had been asking to go trick-or-treating for weeks, so he was pretty excited when the big day finally arrived! Just like I did with Axel, I've been taking a weekly photo of Lennox. I've kept it mostly the same, but swapped out the German safety goggles for some fun steampunk costume googles, so there is something to set his photos apart from Axel's. Even though they were both born 5 weeks early, Lennox is way bigger than Axel was at the same age. He's growing so fast he's already too big for his newborn sized clothes. Besides their size, the other big difference is how much harder it is to photograph Lennox. Finding time to set up the picture and take the shots with a 3-year-old running around and "helping" is challenging! Last week Axel, Lennox and I went to a dress up party. 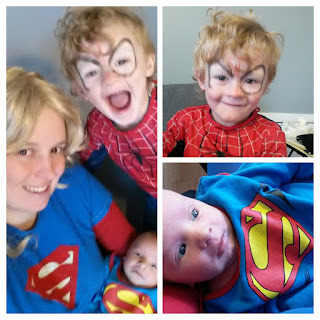 There's no shortage of costumes around here, so when Axel decided to be Spiderman, I pulled out some superhero costumes for Lennox and me too. Yesterday we dressed up again for the Canada Games Centre's Spooktacular event. This time it was just Axel and I, and we went as Rocket Raccoon and Groot from Guardians of the Galaxy. I made the Rocket costume and Groot mask for Yukomicon. There's also a full Groot body suit for Chris but it's not finished yet. Hopefully it will be done in time for Halloween and Axel's Guardians of the Galaxy themed birthday party.